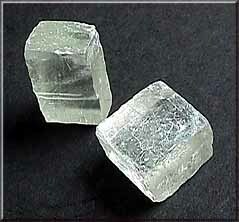 Calcite is made of calcium carbonate (CaCO3). Generally white to clear, it is easily scratched with knife. Calcite is number 3 on the Mohs Hardness Scale. Most seashells are made of calcite or related minerals. This is the 'lime' of limestone. This page was last modified on 14 May 2008, at 02:22.